See the palace of Versailles, Giverny for Monet’s house and garden in one day. Giverny and Versailles private tour – A great Paris day trip. Inclusions: Entrance fees to the Versailles Palace, entrance fees to Monet’s Home and Garden, private tour guide service, private transportation, taxes, tolls and parking. Closings: Giverny is closed from November through March. Both Giverny and Versailles are closed on Mondays and some holidays. Enjoy a Giverny and Versailles private tour with our expert English-speaking tour guides. 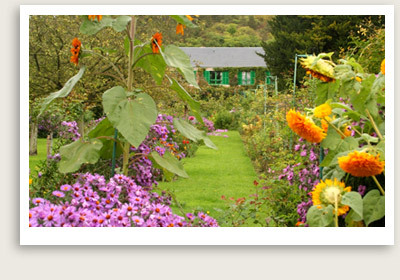 This day trip from Paris will begin in Giverny, made famous by Claude Monet. The painter settled in the house with his lady-friend and their combined children of 8 until his death in 1926. You will enjoy your private tour guide’s introduction to the life and work of Claude Monet. You will tour Monet’s Flower Garden, the Water Lily Garden and the wisteria-covered Japanese bridge. You will have a guided tour of Monet’s house and his artist’s workshop. Afterwards, you will go from art to aristocracy with a visit to Versailles. French history will come alive as our excellent Versailles tour guide whisks you on this guided tour of the sumptuous palace of Versailles. The tour of Versailles will take you on panoramic tour (no inside visits) of the Grand Canal, the Grand and Petit Trianons, and the Hamlet of Queen Marie Antoinette. Hear the interesting and sometimes outlandish stories about Louis XIV, the “Sun King” and those who resided within the palace. This Versailles private tour showcases the architecture of the château and the outbuildings, although our limited time will not afford us entry to the latter. Enjoy a tour of the Royal Apartments, the Chapel, the Hall of Mirrors, and the Queen’s Apartments. Your private tour of Versailles will end at the terrace overlooking the Palace’s magnificent gardens and groves. Note: Longer Giverny and Versailles private tour is available which showcase these destinations more extensively and appropriately. 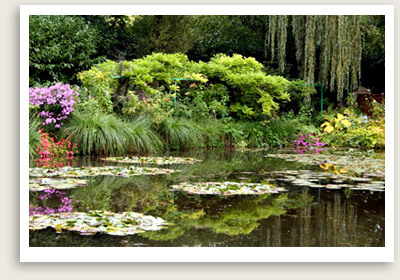 This short version of Giverny and Versailles private tour is suggested ONLY for those with very limited time in Paris. If you want more than just a quick overview of these 2 sites, please book longer tours of each one. Also note that this combo tour has limited time to visit the palace of Versailles and no time is left to do Versailles gardens.